This comprehensive, full color hematopathology reference book emphasizes immunophenotpic features, cytogenetic studies, and diagnostic molecular aspects. 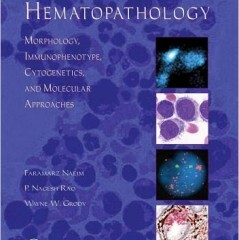 Hematopathology: Morphology, Immunophenotype, Cytogenetics and Molecular Approaches begins with introductions to morphologic evaluation of the hematopoietic tissues and principles of immunophenotyping, cytogenetics and molecular studies followed by chapters dedicated to different types of hematologic disorders. Each chapter starts with a basic overview of hematopathlogy followed by a comprehensive review of immunophenotypic, cytogenetic and molecular findings. The text is balanced with large numbers of full color images, graphs, charts, and tables to assist the reader in understanding these highly technical issues. Dieser Beitrag wurde am 31. Mrz 2010 von Oliver Obst in e-Books veröffentlicht. Schlagworte: e-Books, Elsevier, Elsevierbuchpaket.